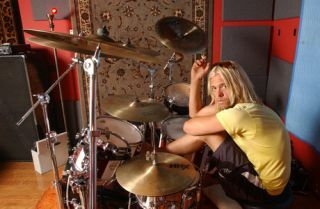 Taylor Hawkins has spoken about Europe's love of rock music, his disdain for studio wizardry such as Pro Tools and multi-tasking while behind the kit. The Foos sticksman told Associated Press that singing and drumming on stage with The Coattail Riders is like "running and making dinner at the same time". Which actually sounds pretty difficult to us. Taylor also noted the differences between Europeans and their US counterparts. He said: "America is tough for rock music. Rock 'n' roll used to be the main music for the youth, and it's not so much anymore. It's hip-hop and stuff." Turning his attention to Europe he added, "Rock 'n' roll is still a stranglehold there, they seem to embrace rock 'n' roll musicians." Taylor wasn't quite so complimentary when it came to how technology, in particular Pro Tools, has influenced rock music. "It's ruined music as far as I'm concerned, at least rock 'n' roll. It's great for dance music." Sounds like we can expect the new Foos record to be a Pro Tools-free zone, then.